A 12-year-old super villain as the protagonist? The concept is irresistible. 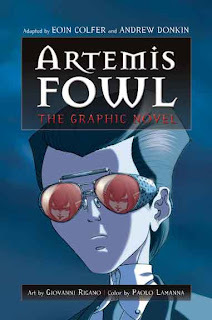 The great mastermind, Artemis Fowl, is a criminal and plotter-of-bad-things. What’s to be expected when a super genius is essentially parentless and left to his own devices? Filled with fairies and technology, ARETMIS FOWL is an action adventure unlike most others. Even the most intelligent of children need guidance and protection lest they travel the road less desirable. The story is not new. Many a parentified child has made bad choices and fallen into bad ways after tragedy or sickness, after neglect, after pain. It is, indeed, an old story, but one worth exploring with kids. The mixture of panels and authentic documents make for a delightful read. The art is slightly stylized and modern, without being overly dramatic or distracting. This is a book mostly for older elementary kids. Seems to me that bad paths – choices – is a great place to start with ARTEMIS FOWL. Not only dissecting why he makes the choices he makes, but more importantly, how he can learn to make new choice, better choices. In the end, what does Artemis choose, and how (if at all) is his character different? I also think it would be very interesting to compare and contrast the original prose with the graphic novel adaptation. What was left and what was taken out? It is very interesting that the original author played a role in adapting his book to graphic novel. It can be fun to play the bad guy, to like the bad guy, and to explore those relationships. Is the bad guy really a bad guy? Is he all bad? So much to explore.